From right: Russian President Vladimir Putin, President of Azerbaijan Ilham Aliyev and Hassan Rouhani, President of the Islamic Republic of Iran, during a photo session prior to the beginning of the trilateral meeting in Heydar Aliyev Center, Baku. Analysts believe that Russian policies in these regions are no threat for Western countries. 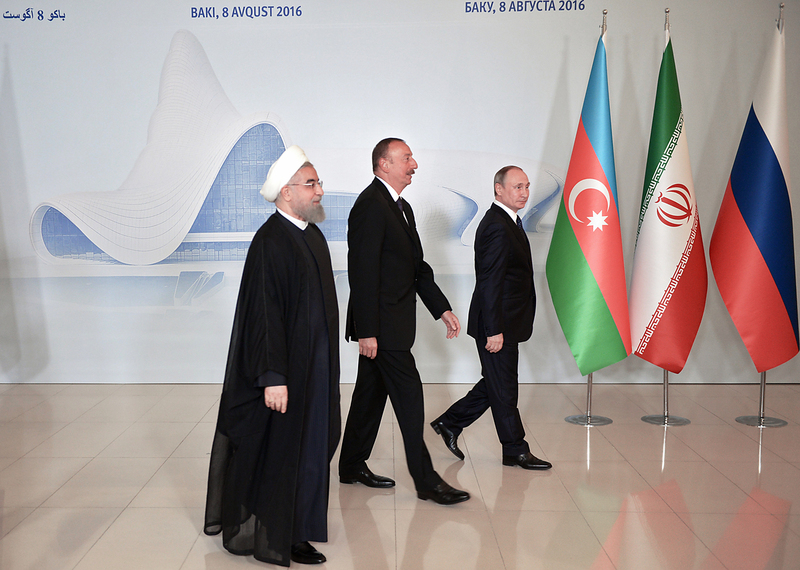 August was a month of active Russian diplomacy in West Asia and the Caspian region. A meeting between Russian President Vladimir Putin, Azeri President Ilkham Aliev and Iranian President Hassan Rouhani took place in Baku on August 8. Putin met with Turkish President Recep Erdogan the next day, their first encounter after a seven-month crisis in bilateral relations. President Putin then met with Armenian President Sergei Sargsyan on August 10. Following these high profile meetings, Russia's Caspian Fleet held unexpected drills in the Caspian Sea between August 26 and 31. Also in August, the international community was caught unawares by news of Russia's Air Force using a military base in Iran. However, soon after, the Russian Air Force had to leave there because of a misunderstanding. Russia actively used diplomacy for its West Asia policy till the end of September 2015, consistently defending a multi-track approach and a diplomatic solution to the Syrian crisis. The situation changed after September 2015 when Russia, at President (Bashar al-)Assad's request, began a military aerial campaign in Syria against terrorists from Islamic State, which is banned in Russia. "Russia has several objectives in Syria. First, it is to preserve its presence. Secondly, the fight against radical Islam," explained Nikolai Kozhanov, Middle East and Eurasia analyst at the Chatham House programme. Moscow's involvement in the Syrian crisis was the reason for the Russia-Turkey conflict. On orders from Ankara on November 24, the Turkish Air Force downed a Russian Su-24 fighter, which it claimed violated its air space, an accusation that Moscow still denies. As a result, Russia introduced sanctions against Turkey and all senior level government and bureaucratic contacts were broken off. Turkish President Erdogan sent Putin a letter of apology for the incident at the end of June. The two leaders met in St. Petersburg on August 9. This led to speculation on a possible alliance between Russia and Turkey, and Iran, which is being been actively courted by both Ankara and Moscow. Analysts believe that it is not worth speaking of any triple Russian-Turkish-Iranian alliance. "There will not be such an alliance. Russia's policy in the region is very pragmatic. Moscow wants to speak with everyone and preserve its good relations with everyone. Besides, Turkey and Iran have their own objectives in the region. Ankara is basically using Russia for its own interests, since it wants to show the Western countries that its can easily reconcile with Moscow," said Kozhanov. Igor Istomin, professor at MGIMO and a specialist in Russian-American relations, said the external sides of the Syrian crisis are constantly manoeuvering and trying to find profitable cooperation. "Three countries are aspiring to leadership in the region: Turkey, Iran and Saudi Arabia. Moscow understands this perfectly and thus is trying to distance itself from close cooperation with any of them. Russia doesn't need allies in the Middle East. It wants to distance itself from everyone and at the same time reach its objectives," noted Istomin. With regard to Russia's increased activity in the Caspian region, analysts surveyed by RIR said the region had never stopped being a sphere of Moscow's special interests, unlike West Asia. "Russia has always given great importance to the Caspian region," affirmed Alexei Fenenko, security analyst and leading scientific collaborator at the RAS Institute of International Security Issues. "Especially in the 1990s, when Moscow believed the region had enormous hydrocarbon reserves. But it turned out that there are not that many hydrocarbons there after all. But in terms of security, Russia has always been active in the region, so it is futile to say that it has renewed its activity only now." Western countries are closely observing Russia's actions in West Asia and the Caspian region. However, they believe there are no grounds to be worried. "For European countries, Russia's involvement in Middle Eastern affairs does not present a threat. Perhaps it's a threat for the US, but it is a threat concerning status, for their reputation," said Istomin. Russia is more dangerous for the region if it is ignored believes Kozhanov. "Moscow needs to be spoken to. It's necessary to take its interests into consideration. It will not be a leading player but it can provide cooperation on a wide range of issues. The West must understand that worries about Russia's increased activity in the Middle East can be both justified and not," he said.